A Stunning Wedding at Nunsmere Hall, Tarporley, Cheshire. And to top it off the Bride and Groom had a wedding magazine front cover! Emily & Joseph chose Nunsmere Hall for it’s glorious surroundings and ability to cater for lots of guests. With 25 in their wedding party alone, this itself was a small wedding party lol. Nunsmere Hall is one of the most luxurious Cheshire wedding venue locations I have photographed at. Surrounded by stunning grounds and its own lake, Emily & Joseph’s wedding day oozed opulence. Nunsmere Hall itself is a country house, with Sir Aubrey Brocklebank as its first owner, Chairman of The Brocklebank Line. Along with it’s amazing heritage, it’s been Awarded four red stars, two rosettes by the AA. From black bow ties and electric blue wedding suits the boys looked fabulous. The bridesmaids in white, with the most colourful wedding bouquets I have seen for ages, the choice for complementing each other was perfect. Emily’s wedding dress was made by a family friend and was just off the scales. She loved every minute wearing it. With their ceremony and little Bo’s christening all in one ceremony at St Marys In West Derby, Liverpool There was time to rest on the journey to the wedding reception, which is always welcomed. 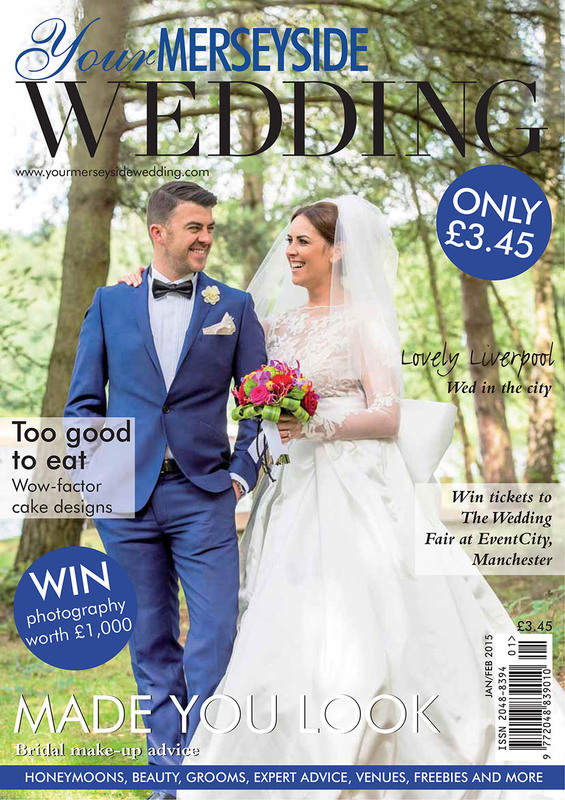 As soon as we arrived at Nunsmere Hall we headed straight to the lake to make the most of the weather, this is where we took the shot which landed on the front cover of Your Merseyside Wedding Magazine.